Not so many people foresaw what was to unfold at Goodison Park on Sunday afternoon. 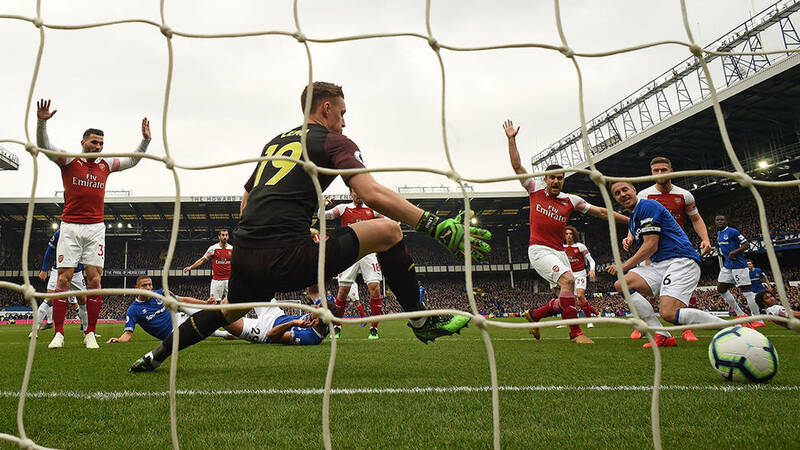 Arsenal were dealt a heavy blow in their race to finish in the top four, courtesy a one-goal loss to Everton. The encounter did not start well for the Gunners as they had to make do with what they had, meaning the likes of Mohamed Elneny and Henrikh Mkhitaryan got starting places. Everton left with all three points having taken the lead inside the first ten minutes through Phil Jagielka's close-range tap in following the visitors' failure to clear off the threat from a throw-in. Unai Emery's men continued to be a shadow of their recent selves and not even the introduction of Aaron Ramsey and Pierre-Emerick Aubameyang helped to change the result at the end of the day. They missed out on a golden opportunity to go to third spot where they occupied before Tottenham Hotspur leapfrogged them in midweek. The 1-0 loss at the Merseyside was a continuation of the North London side's poor away form which has seen them unable to keep a single clean sheet on the road since the commencement of the ongoing season. Varying reactions have emanated from fans especially those that felt it was all the fault of the manager but the truth is that he was limited in resources. Granit Xhaka, for instance, is not fully fit after an injury he suffered in a match for Switzerland two weeks ago. Similarly, Ramsey returned from international duty with an issue, was used against Newcastle then got a setback, so the decision not to start him is justifiable. Those who were not calling for Emery's head had one or two players to blame for yesterday's misfortune. Below are some of the tweets. @UnaiEmery_ Do you realize we have a poor away record. Bros if Arsenal dont go to champions leave you will just pay me my $1800 that I made bet with a Chelsea and Manchester United fan. Mistake of the day by the arsenal manager. the lineup for today's against Everton was flexible because no Granit, Torrera .that's make job easy for the home side. @UnaiEmery_ : I’ll tell you what went wrong!! Your team selection was pathetic!! Jesus Christ!! @aaronramsey AND @Aubameyang7 on the bench?!! FFS!! That decision HAS cost us Champions League football next season! If we can’t beat Everton, we won’t beat Napoli!! FOOL!! Action continues for Arsenal in the first leg of the quarter-final of the Europa League on Thursday before getting involved in another away fixture which will be with Watford on the Monday that follows.